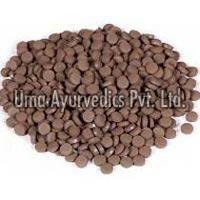 Kharliya Rasayanas form is the largest group of herbo- mineral Ayurvedic therapeutic agents. Most of them have the kajja prepared by triturating mercury and sulphur together in a crucible by mortar. Being exclusively prepared in crucibles they have been called Kharliya. These drugs are prepared by blending Mercury and Sulphur together by impregnating the mixture with a particular decoction or the fresh juice of the herbal drugs and then blending a number of incinerated / calcined organic and inorganic therapeutic agents or the herbal powder in it. Only the drugs that have been purified and detoxified in proper manner by the suitable procedures described in Indian pharmaceutical literature are supposed to be used in its preparation. Therefore, the seemingly easy process in fact requires a great deal of the knowledge and art of Indian pharmaceutical science which can be obtained by constant practice and experimentation under the able guidance of some learned person. Gutikas are also known as the vataka, vati etc. Most of them are purely herbal therapeutic agents and are prepared by powdering the herbal drugs and then binding them with help of jaggery, honey, guggulu etc., or by lavigating with fresh juices or decoctions of different herbs and making pills of the paste thus obtained. We, UMA AYURVEDICS PVT. LTD. have been able to do so with our unrelenting enthusiasm in this field. Our proud standing in the domestic market and the faith shown by our esteemed customers in us for last 70 years is testimony to this fact in itself. We, UMA AYURVEDICS PVT. LTD., pledge to stand by our standards in the coming years as well. 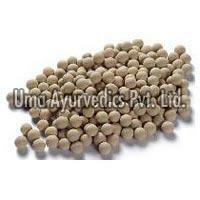 We also specialize in providing Agnikumar Ras, Arogyavadhini Vati, and Sutskher Ras. 2 Agnivardhak Vati Kala Namaka, Nausadara, Mirca Dyspepsia, Hyperacidity AY.S.S. 3 Ajeernkantak Ras Shuddha Himgula, Suddha Vatsanabha, Shuddha Taa, Marica, Pippali Dyspepsia & other digestive impairments Bhes. Rat. 8 Bramhi Vati (Buddhi Vardhak) Rasa Sindura, SvaramaksikaVaca, Kali mirca, Sankhpuspi, Gavjava, Neurological disorders, AY.S.S. 9 Chandrakala Ras (With Pearl) Shuddha Parada, Shuddha Gandhaka, Abhrak bhasma, Tamra bhasma, Mukta pisti, Giloy sattva Dysuria, Bleeding disorders, Burning sensation AY.S.S. 12 Chounsathprahari Pipal COPD, Respiratory tract infections AY.S.S. 18 Hridayarnava Ras Shuddha Parada Shuddha Gandhaka, Tamra bhasma, Triphala Cura Cardiac disorders due to vitiation of Kapha dosa Bhes. Rat. 20 Kafchintamani Ras Rasa Sindura, Shuddha Hingula, Shuddha tankaa, Bhanga Cough, dyspnoea, Headache AY.S.S. 33 Madhumehnashini Gutika (W/o Gold) Trivanga bhasma, Gumara patra, Nimba patra, Shuddha Silajita Diabetes type 2 AY.S.S. 36 Makardhwaj Vati Makaradhvaja, Kapura,Kasturi Jayaphala, Kali mirca, Sexual dysfunction AY.S.S. 37 Manmath Ras Shuddha Parada, Shuddha Gandhaka, Abhraka bhasma, Tamra bhasma, Lauh Bhasma, atmagupta, Satavari Erectile dysfunction, Elixir & Aphrodisiac Bhes. Rat. 49 Ras Pipari Shuddha parada, Shuddha Gandhaka, Trikatu,Atisa, Karkata Sringi, Jayaphala Upper & Lower respiratory tract infections AY.S.S. 58 Somnath Ras Lauh bhasma, Shuddha Parada, Shuddha Gandhaka, Ela, Haridra, Daruharidra, Shuddha guggulu Genitourinary disorders Bhes. Rat. 62 Trimurti Ras Shuddha Parada, Shuddha gandhaka, Lauh bhasma Rheumatism, Oedema, Obesity Yog. Rat.